It has been over three months since the Arab Spring arrived on Libyan shores. The Libyan Civil War started there in February of 2011 after Ben Ali of Tunisia and Hosni Mubarak of Egypt begrudgingly relinquished power in the neighboring North African nations. At first it had appeared that Mubarak would resort to thuggery and despotic abuse of his powers. But due to the brave people in Tharir Square in Cairo, he eventually was forced out by the Egyptian army and under American pressure once the Obama administration calibrated their stance to not support a long time ally in Mubarak and instead follow the popular opinion of the people of Egypt against his autocratic rule. Unfortunately for the people of Libya, Muammar Gaddafi is not ready to step down from over 40 years at the helm of Libyan society. His army brutally quashed a rebellion against his rule and when it appeared that many thousands more would be killed by his troops, the US and NATO forces intervened and bombed Libyan government forces. The standoff between the Libya forces of Gaddafi and the US and NATO bombings have left Libyans in the middle as their nation continues to suffer several months into the fighting. A brutal dictator like that who cares more about holding onto power than the fate of his nation does not deserve any honors. Instead he deserves to be tried for murdering many innocent people and if found guilty he should be hanged. Therefore it is a shame that in Pakistan, one of the country’s most important stadium continues to bare the name of the Butcher of Tripoli. Yes, Gaddafi stadium in Lahore, a venue for many Pakistan Cricket Board sanctioned domestic and international cricket matches, is named after the Libyan dictator. The stadium was built in 1959 and was originally named Lahore Stadium. However it was renamed in 1974 to Gaddafi stadium in honor of the Libyan ruler who had given a speech in favor of Pakistan’s right to pursue nuclear weapons at a meeting of the Organization of Islamic States Conference (OIC). 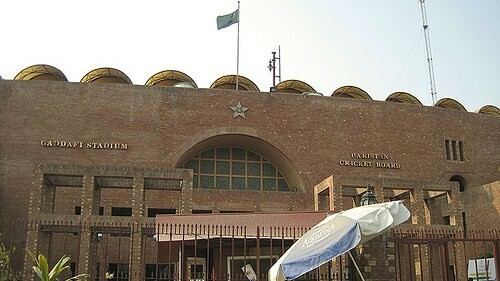 The stadium also houses the headquarters of the Pakistan Cricket Board (PCB). But now, as Qaddafi continues to kill his own people in the most brutal of ways, it is time that Pakistan’s Cricket Board changes the name of the country’s premier stadium back to Lahore stadium since honoring this man responsible for indiscriminately killing his fellow citizens unnecessarily further looks negatively upon Pakistan. A country that already has a grave public relations image problem can surely give itself a break by doing something as simple as changing the name of this stadium. Afterall, what does it say of Pakistan if it continues to honor a man like Gaddafi? Do Pakistanis not care that this man is responsible for killing thousands of his own people? It is time to put pressure on the Pakistan Cricket Board and on the government to immediately change the name of the stadium. I know that Pakistan has many other problems inside this fractured and unstable nation to think that changing the name of Gaddafi stadium can fix all that ails the country. Nay, it is merely a drop in the bucket. There are countless other problems facing the country that are too many and too complex to list here. But one easy fix the country can do to help improve its image is to change the name of this stadium. There is absolutely no reason that the stadium should be associated with a lunatic such as Qaddafi. The name should never have been changed to begin with no matter what support he gave to Pakistan’s nuclear aspirations. He has never been a good or stable leader. In fact, the man is thought to have been directly responsible for numerous acts of terrorism in the 1970’s and ’80’s including the Pan Am Lockerbie bombing. And this was BEFORE he started killing his own people in order to quash a rebellion against his rule! In light of the many recent embarrassments for the nation such as Osama Bin Laden’s hiding in their country, the continued imprisonment of Asia Bibi, the killings of Salmaan Taseer and Shahbaz Bhatti, Pakistanis must decide whether or not they want to join the community of nations or become a pariah state much like North Korea, Libya and Iran. Changing the name of the stadium is a small step, but it is indeed a step in the right direction.